Home » Blogs » Clive VanBuerle's blog » Commuter Rail System - for us? Hello All, I've been regularly peeping into this site to see what’s going on, my interest began with the launch and delay of BIAL and I’ve been hooked on, KBsyed, idontspam, A mahesh, devesh and others ...i know all of you by reading your thoughts over the last year and hopefully you will continue to add your ideas. Ok to begin with I was pleasantly surprised to know Hyd had a CRS within the city...attached are some pictures of the system..its impressive...while i think all other efforts like the metro and high speed link are all good options we should play around with this option too..Has anyone tried this before? i maybe late in suggesting this and there must be a reason for a seemingly good option not being implemented sooner? There are many possible routes on existing tracks that have been proposed by study reports earlier. However, the South Western Railway does not appear keen to build & operate a city system as most such systems in the country have been financial burdens needing subsidies to keep them going. I do not know much about the Hyderabad system, but I recently saw the Chennai MRTS & they were running empty most of the time. Mumbai is the only system that is operating well. MMTS was built on an equal expenditure basis by Government of Andhra Pradesh and the South Central Railway and is operated by the latter. GoK should put their money where their mouth is. CRS will not happen by leaving it to IR. I have mentioned this before, have a state authority which will buy the rolling stock and invest in signalling and let IR just control traffic. Hyderabad CRS - Any Stats ? What I meant was that I am not aware of the ridership levels & revenue generation or finances of the Hyderabad system vis-a-vis what I physically saw at Chennai a few week ago (running nearly empty). If anyone has links to such information, please do post it here, thanks. SWR alone, GoK or MoUD subsidise some capital expenditure for them (track doubling, first set of rakes/EMUs). A Joint Venture betweek GoK, SWR, like MMTS of Hyderabad to operate the service. This JV will have to pay to use SWR's assets. A PPP (put this idea to Mr Ashok Kheny, or Capt Gopinath - such a thing may do more good to Bangalore than them running for elections) that will buy or lease SWR's assets, build new assets, and run Commuter Rail on them. None of the above except #1, or even #1, is going to happen because I am sure BMRCL is going to object - this new thing will be seen as competition by them. Extend BMRCL's jurisdiction to SWR's assets in the city, and have them run Commuter Rails with cooperation from SWR. We can talk a lot of options. And I bet the informed people from government or South Western Railway side would be laughing reading all this - look at the these crazy guys, they talk anything without knowing the details and complications. But sorry, we don't care for these organizational and structural details. Anyone who reminds us of details is only telling us that he doesn't have the will or drive to take initiatives. We know of a problem - transportation in the city, and see a solution because other cities have it - Commuter Rail. Period. Rest is all details, the "how" that I don't care about. I cant find any in the public domain as well. RTI will MMTS will help. But if you are looking to disprove CRS as a concept based on ridership and profitbility we should wind down BMTC and most PT services around the world. Gpoinath may be interested in Cargo and IR has already opened up Cargo train services for PPP. It sees money there. It has not done the same for commuter as like Naveen said there could be losses involved. This is where the GoK has to step in. they talk anything without knowing the details and complications.
" But if you are looking to disprove CRS as a concept based on ridership and profitbility we should wind down BMTC and most PT services around the world ". The question here is about utilization & benefits for the city with regards to investments made. If a service (such as the one in Chennai) were started & then does not fulfil these objectives, but demands heavy subsidy out of the government instead to keep it running, what purpose would that serve ? No one is trying to disprove anything here. Rather, some are jumping to conclusions without fully understanding what others are pointing at. BMTC & many such PTs are providing services to the citizens in many cities & it is acceptable even if they lose a little money, but when they operate year after year with heavy subsidies, it becomes a lose-lose for all. I believe CRS is certainly an option, but as SB says, the organizational and structural details are needlessly posing hurdles. SB - I like your idea for BMRC itself running Metro trains on SWR's rail infrastructure with enhancements. Building costs will also be reduced since they will run on the surface (viaducts will not be needed), as also minimal disruption to public during the building phase. We had an earlier thread for Kengeri-Whitefield shuttle train here : http://praja.in/bangalore/discuss/2008/07/kengeri-whitefield-shuttle-train. Bottleneck I see is the SBC-Whitefield link which is highly utilized with trains running every 10 minutes in that route. I was just thinking if one shuttle train between Kengeri-SBC or Bidadi-SBC started to run every hour and observe the occupancy level. Commuters can hop off to intercity trains like Chennai Mail or Marikuppam passenger and getdown at Whitefield / Byappanahalli / KR Puram. If the occupancy level increases, an additional track can be laid from SBC till Whitefield. This needs additional lands, but may not be expensive. If it fails, Bidadi/Kengeri train can be extended to Channapatna. Many daily travellers to Bangalore will be helped a lot. All the trains are crowded from Channapatna. SBC - Whitefield line choked?? Vasanth, these days, I take my son to Whitefield station one evening every week (to show him trains, he loves them). In fact, while doing some train watching, I ran into an IRCFA member also, who too felt that the Whitefield - KR Puram stretch is not choked. 5.30 - 6.30pm, or 6-7pm, full one hour in the evening, the rail crossing gate near Whitefield station is shut about 3 or 4 times. One day, it was 5 times. So max peak usage during commute hours that I have 'seen' is every 12 minutes. Now, I have done some train watching at Kanjurmarg and Andheri stations during my IIT-B days as well (over 2 decades ago). I think the tracks (both, fast and slow pairs) at Mumbai took in a train every 5 minutes or so, or perhaps even less. Stats above are observation based, don't rely on them please. But the question is - how do we know that SWR is making the most use of their tracks? All our past discussions on CRS have stopped at this point - we need to meet or RTI SWR to get this data and compare this data with some nice benchmark (Mumbai?). Vasanth, Naveen - why don't you and I just take the next step this time and start on something. WIthout doubt there has to be a proper evaluation done on utilization of current tracks. Additional tracks may be required, Additional stations will need to be put in. Are there any technical studies or recommendations on CRS for bangalore? The only links I get lead back to Praja!!! Are we the only people talking about it? Within the BMA, approximately 120 km of rail system of the Indian Railways exists basically for long distance passengers and goods/ freight. This system currently is not being utilized for intra-urban movement with in the BMA. However RITES in its study has identified some of the Railway corridors along which it is possible to run commuter service with some additions and improvements. A similar proposal of utilizing approximately 62 km track and incurring an expenditure of Rs. 650 Crore on making the commuter service possible in two phases (2007 to 2012 & 2013 to 2018 each estimated to cost Rs. 325 Cr.) has been recommended in M.P.2015. The plan has also indicated a land requirement of 62 Ha. for this project. However it is found that the network proposed above will not be sufficient to meet requirements of the Development Area proposed in Master Plan 2015 upto the year 2025. Accordingly it has been considered necessary to extend the CRS network to approximately 119 Kms, using the existing at-grade railway system to serve intra-city needs, which is proposed along the corridors 1 to 7 in Table 7.4. In addition, with the coming up of the BMRDA’s planned new Town Ships at Bidadi, Ramanagaram, Solur, Sathanur & Nandagudi, high level of commutation between them and the Metropolis. Also, with the development of the huge Multiple Economic Activity Areas like Electronic City, I.T. Parks, Industrial & Commercial Areas with consequent job opportunities on the one hand and availability of comparatively cheaper accommodation in surrounding towns like Hosur, Ramanagaram and Tumkur etc. where a large number of working population is likely to live, substantial of commuter movement between these towns and the Metropolis will take place. In order to cater to this suburban commuter traffic, the CRS is proposed to be extended as corridors 8 to 10 in Table 7.4 below. Corridors 1, 2, 6 and 9 are proposed to be taken up in the I Phase, while Sl No 3, 4, 5, 7 and 8 will be taken up in the II Phase. The Corridor at Sl No 10 upto Tumkur may be taken in III Phase. The drawing below shows all rail lines. To carry forward the CRS idea, I think you are right, SB - we must take it to the next level. Can we get more ideas of how useful services could be started within the available network ? SB, Block size kept here in Bangalore is of larger size since it is intercity trains,probably one station to another as one block like SBC - Cantonment, Cantonment-Bangalore East,etc. Mumbai Locals might be having very small block sizes without having stations as block seperator. Probably IRCFA members will have more details on this. Practically after reading your stats, it should be possible to introduce atleast 1 or 2 trains , atleast during peak working hours keeping smaller blocksizes with more signalling. Even our Namma Metro might have already employed signalling experts, probably they too could pitch in. RTI is one answer to get the answer. Can ABIDe do something? about how cheap is commuter rail system compared to Metro and Mono. 1. Develop alternate routes for freight traffic. SBC-Byappanahalli has the most traffic and it reduces after Byappanahalli, since few trains divert towards Yelahanka and few towards KR Puram - Whitefield. Our focus area is reducing railway traffic on SBC-Byappanahalli to incorporate commuter-rail system or local trains. One thing that the SBC-Byappanahalli traffic will contain is the freight traffic. This is because Goods Shed is in SBC. Develop another Goods shed at the outskirts like done in Mysore at the tip? Other thing is the goods coming from Mysore travelling towards Byappanahalli. As per this article, develop alternative routes for freight means we should have a circular link at the entry points Yelahanka, Whitefield Yeshwantpur connecting to Kengeri. (Just thinking theoretically). For the passenger trains, I was just thinking of satellite train stations like Yeshwantpur at Whitefield and Yelahanka. Except very main and important long running trains, many of the passenger trains can be cutoff at these points. Passengers can hop off the long distance train and hop on to commuter trains running between say whitefiled to SBC / Yelahanka to SBC. Yelahanka bound trains can also be routed via Yeshwantpur to SBC if we indeed need the trains to reach SBC. This may be inconvenient to many passengers especially for the old age people, people with kids and people with luggage. But, just a thought. friends, there is a universal, fundamental solution to everthing. of being "providers of solutions". what i mean is, if BMTC, for instance saw themselves as a "provider of public transport solutions"
rather than a "bus company" then we'd see very different results. likewise the other service providers of our government. its always about the mechanisms and financials and details (and kickbacks). they forget the core value should be people! "solution to a problem of a set of people"
to provide a way for pedestirans to get to the other side. the old airport rd clover flyover is a good example. without risiking life and limb!! you!! if the footpaths dont get you, crossing the road certainly will !! and the process of getting a voter iD, designed for permanant psychological damage !! If we move City station out to 2-3 satellite stations, we can free SWR tracks inside the city. Going towards Chennai? Then take a rail to Whitefield station. Going to this multi-satellite station arrangement may require building new peripheral ring tracks around the city (analogous to Peripheral Ring Road). this ring rail could connect these satellite stations. The argument against such a thing, or any such transportation routing reform is - you are adding interchange points in the system. But hey, developing smooth interchange points is the foundation on which good transportation systems are developed. How long can we keep avoinding focusing on this foundational aspect? Bottomline, we need to think hard to find ways of using Railway tracks inside the city. What I have said above is one such thought, may not be the best idea - I am okay with that. But tracks inside the city can't be wasted only on long transit purposes. Past post with similar thoughts: "Edge stations ..."
its not that far fetched an idea...but nor is the multi nodal you suggested. like i said in an earlier post, it has to be a solution-for-people driven idea. the mechanics of it follow. 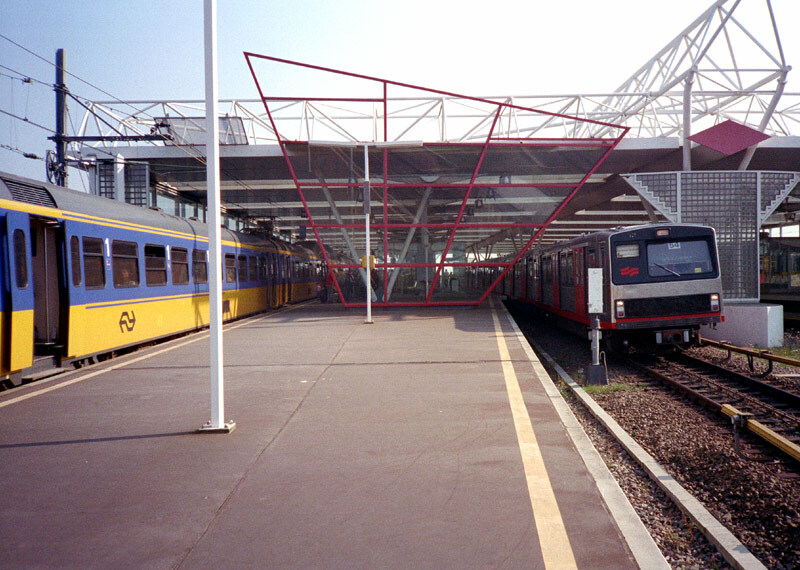 An example of transport integration with changeover from Metro to Long distance train. Sameway we should have the long distance starting next to the Local train with a common platform. Platforms for the local should be built on either sides. On the other side of the platform, arriving train can stop. The next best alternative without all the fight is this along the ORR. Metro on CRS Routes ? SB, Vasanth - Noted your comments. I feel that there is a good chance to make this work well if BMRC is to operate the services with some of SWR's infrastructure & land adjacent their tracks. Expecting SWR to operate an urban rail (they have no experience in this) maybe similar to asking a train driver used to long haul trains to suddenly start operating Metro trains also alternately ! Also, introduction of a new entity into urban transport & expecting all of them to co-ordinate based on customer needs & meet demands & well - you know how the various government bodies co-ordinate. These are the same reasons why the Chennai MRTS is still running nearly empty - I was tempted to board a train at Annanagar in Chennai recently, but my sources advised me that bus was better as the train stations are too far from bus stops & that I might have to take an auto when I had to transfer to a bus ! We do not want these sort of mistakes here, for sure. If we want to demand a system, the entire focus has to be on the users, as jennypinto very rightly points out. Unless most, if not all the stations are positioned in such a manner that it is easy for commuters to transfer to other modes without inconveniences or is an activity center by itself in some high density surroundings, the utility will be poor & it will effect the system's operation badly, as it has done in Chennai & other cities. The other routes recommended in the CTTP could remain under SWR's domain as they are all from BMA boundary to nearby towns & would qualify as suburban services. The five routes above add up to about 92 km, but construction costs would be much lesser than elevated routes. There will be some land acquisition (for trackage, stations & other rail infrastructure & for approach road improvements at stations), but there will not be any viaduct construction (No disruptions, too !). If regular Metros operate along these routes, the possibility to create satellite inter-city rail stations increases, & decongestion of city centers would become a reality, too. 1) Metro tracks (including width) & also signalling are quite different & the trains will need separate infrastructure to be created at grade. 2) Station locations & approaches for roads will need to be identified since bus services have to reach the stations. 3) Metro (Ph-2) & also Monorail, if there is going to be one will need to be realigned to avoid duplication & to integrate with these new Metro routes. Sorry to burst this bubble, but CRS in Bangalore is *not* likely to happen any time in the future. The reason is simple - the railways is just not interested. At a meeting held about two months ago, a Member of the Railway Board, who was also a former GM of SWR, categorically stated that the Railway Board has decided, as a matter of policy, not to introduce any new suburban railway services in the country. The railways will henceforth focus only on medium, long-distance passenger traffic and freight traffic, while leaving short-distance suburban services to local authorities such as Metro Rail corporations as the model is simply not viable for them. So, unless there is a drastic change in policy, we can kiss the CRS goodbye. NM seems our only hope now. Sorry to be the party-pooper, but let's not set our hopes on something that's extermely unlikely to materialise. You seem very positive about SWR not operating a CRS in Bangalore based on Railway Board's decision. I was suspecting that some such development might occur after the Chennai fiasco & I reckon, the Hyderabad MRTS has also been losing money heavily, not to mention Delhi & Kolkata, which have also been performing poorly. Anyway, SWR has lent some of it's land infrastructure for development of NM along the Swastik~Malleswaram alignment, is'nt it ? Similarly, I would think they can at least part with land adjacent their present tracks to allow NM to run surface trains by the side of their alignments. If NM has to be quickly developed on it's own all across the city, there will be too much disruption with heavy costs & funding will be a major obstacle, not to mention agitation by land losers as much more land will be necessary, I'm sure for such a development. If quick solutions are to be found, this may be the only answer, though alignment suitability will remain a big question mark. Perhaps Good for the City ! "We know of a problem - transportation in the city, and see a solution because other cities have it - Commuter Rail. Period". Well, in the long run, may be the Railway Board's decision will pan out to be good for the city as the attention will now shift more seriously to hunt for alternative solutions (hopefully ! ), though it will take a long time & involve huge costs & disruptions. Since entirely new systems have to be put in place, the chances of getting them better aligned with the needs of the city are much higher. I had always doubted the success of the idea of "running trains because tracks exist". This is not in synchronization with commuter demands & is supply-oriented - difficult to get them to work for the best intersets of the city's urban travellers. Hyderabad & Chennai will, however, continue to be caught up in a "tangle" as planning new Metro lines will have to take into consideration the existence of already developed urban rail infrastructure & this might impose some hard questions upon themselves about wastage & as to why fresh investments are being made when a rail network has already been developed. Route alignments will also be constrained as it would have to take account & cannot ignore the existence of these lines that are already running, though poorly. Their decision is about them leaving short distance service to local authorities and not doing it themselves directly. Railway's goal is to focus on long distance transportation, fair enough. They don't need to hang on to their assets in the center of the city to meet that goal. Railways is a public corporation, and their assets are our assets. All they have to do is to state that they are okay letting Metro Rail Corp, or a new Venture make use of their tracks in the city. Just sell out your tracks inthe city to Metro Rail, or a new company or PPP, and in return for agreeing to do so, GoK or the new company will give you land on the outskirts for brand new world class stations. Its a bit like the Army who have a lot of landmass in the city and some argue about the value in Army holding on to them in present days. Railways is not like Army, its a civilian public sector corporation. Naveen, yes, fair enough. I think commuter Rail is a bit of a misnomer here. the point is about making use of SW Railway's tracks etc to solve our city's problem. There are various models available. They don't need to hang on to their assets in the center of the city to meet that goal. Railways is a public corporation, and their assets are our assets. All they have to do is to state that they are okay letting Metro Rail Corp, or a new Venture make use of their tracks in the city. That's where the problem arises. The railways says that their existing infrastructure is too congested to take the load of suburban traffic (possibly one of the reasons behind the policy). Besides, leasing out their tracks to NM or anyone else would involve serious coordination issues (maintenance, signalling etc.) as well as reduce the capacity to run new long-distance and freight trains. The only way out seems to be Naveen's suggestion to constuct NM tracks above the existing SWR tracks, but this too would run into hurdles like overbridges, flyovers, etc.